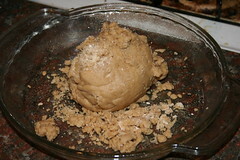 I always hated making pie crusts, because who wants to futz around with wax paper and rolling pins, only to have the whole thing tear when you try to pick it up and place it in the pie pan? Behold, the lazy man's pie crust. I used a fitting for mixing bread dough, but I'm sure a normal blade would work as well. Pulse and blend the ingredients until they are well incorporated. You'll probably have to scrape the sides down with a spatula a few times. 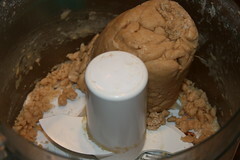 Eventually it should form a ball of dough. Take that ball of dough and dump it into a lightly oiled 9-inch pie plate. 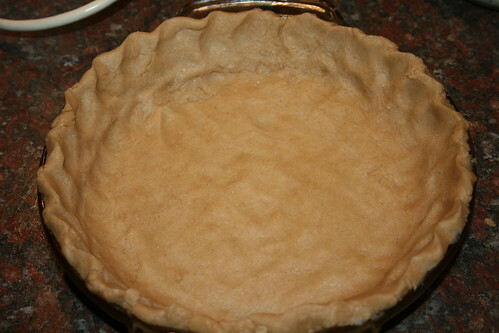 Mold the dough within the pie plate, shaping it into a pie crust, as pictured above.